Rustleif is a Nord blacksmith living in Dawnstar. He and his wife Seren are expecting a child soon and because of her Redguard heritage he will ask you to bring him a book of Redguard lore called Night Falls on Sentinel. With the forge jointly run by Rustleif and his wife, they keep the exact same daily routine. Rustleif gets out of bed every morning at 7am and starts the day with a one-hour breakfast with Seren. They both leave the house at 8am and spend the next twelve hours working the forge; although Rustleif is in charge, if he decides to take a break and just hang out, Seren will maintain the smithy until he returns. At 8pm they both return to the house for a bit of quality time before they go to bed at midnight. 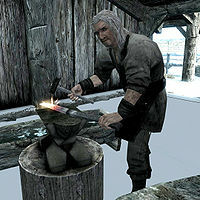 Rustleif wears typical blacksmith attire: a blacksmith's apron and a pair of shoes. He carries an iron dagger, the house key and a selection of common items and gold. When you approach him, he will greet you in many different ways, many of them related to his business but also to current events in Dawnstar. Before the quest Waking Nightmare he will comment, "Seems like no one is getting a decent night's rest in Dawnstar, stranger. Best buy your steel and move on." before moving on to some advertising: "Need a dagger? No? How about a claymore? ", "You looking for a shield? Best thing between you and the enemy, friend. ", "Don't forget getting a good pair of gauntlets. Broken hands can't hold a sword. ", "I work steel, weapons mostly." and "Most of the guards in Dawnstar carry swords forged from his very smithy." He will also mention, "I trained in Hammerfell during my journeyman years. Redguard smiths are second to none." If you have completed the Dark Brotherhood quest Hail Sithis! he may also refer to the Dawnstar Sanctuary: "I hear people were spotted using the Black Door. Gods have mercy." Additionally, if Silus Vesuius has opened his Mythic Dawn Museum, Rustleif will comment: "I can't believe Silus is collecting Mythic Dawn artifacts. Right here in Dawnstar, no less." If you approach him outside business hours he will say: "I'll forge you a weapon tomorrow. Right now, I'm closed." If you ask him to elaborate of the collective nightmares of the citizens, he will tell you: "Nightmares. I haven't met a single man or woman who doesn't admit to having them. A bad dream I can handle, but everyone having the same bad dream, every night? It's a curse, I say. I hear there's a priest of Mara visiting the inn. Maybe the Divines will cure us." He will also tell you about how he works for the ships: "Aye. I've worked on a few moorings here and there for it. Most of the ship captains are superstitious about who works on their vessels, though. And Dawnstar is known for its bad luck. We're the last port of call before Windhelm, and the ore we trade makes rich targets for pirates." When asked about the forge, he will provide some background information about his Redguard wife and ask you to fetch a book of Redguard lore: "My wife Seren and I run it together. She still smiths even though we found out she is with child. Our son or daughter isn't going to get much Redguard culture here in Skyrim. I know my wife worries how she will pass along her traditions. Hey, if you find a book called "Night Falls on Sentinel," could you bring it to me? It's a story from my wife's people. Be good to have." When you accept the favor he will say, "Good on you." When you return to him with the book, he will be grateful: "Don't know what the Redguards see in books, but this will make my Seren happy. Thank you. Let me show you some tricks around the forge." He will then provide a +1 bonus to your Smithing skill. This page was last modified on 25 June 2013, at 01:50.